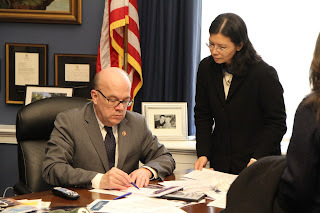 (Washington, D.C-Feb. 7, 2019) ChinaAid delegates continued their advocacy for Chinese human rights and religious freedom in Washington, D.C., today by attending the national prayer breakfast and holding meetings with Congressman James McGovern and a human rights NGO. McGovern also heard from Li Chingyu, the wife of Taiwanese dissident Li Mingche. After the meeting with McGovern, the delegation headed to Human Rights Watch, where they met with a representative of China Director Sophie Richardson and updated them on the latest human rights abuses in China. That morning, members of the delegation also attended the National Prayer Breakfast.